A dominant part of operational problems and faults experienced in hydraulic and lubricating systems is due to contamination of the fluid. This complicates maintenance and is definitive a disadvantages of these technologies. Being well documented, both through literature and through practical experience, we have to live with it, and do best out of the situation. Industrially, there do not seem to be a standard method to resolve the problem. Very often, it seems to be a form of religious belief and not scientific knowledge that is the driving force in coping with the problem of fluid contamination. Hydraulics is normally an area of engineering handled by mechanical engineers. Although control engineers has entered the arena and modern hydraulics is fairly dependent on electronics, the mechanical engineer is still the dominant player. Mechanical filters is the preferred weapon, and the necessary calibre is widely discussed, should a 5m filter or a 2m filter be applied to the particular problem at hand. As doctors, we would probably be sued, if we threated a brain tumour with painkillers or tried to remove a wart with heart surgery. As engineers, we goes free for doing the similar thing. One should recognise that contamination of hydraulic fluids is more than particles, and that particles is more than mechanical objects. Let us take a different perspective, and use the terminology of a chemical engineer. A hydraulic or lubricating systems is an endotherm electrolyte where a mixture of fluids transfer energy with metallic surfaces. The chemical engineer would probably be reflecting over the occurrence of catalytic material and try to analyse the reactive potential of the mixture. At the same time, none of us as mechanical engineers would recognise this as a hydraulic control system connected to the wicket gate of our turbine or the lubricating system of the thrust bearing. However, the above system description could give us a slightly different focus. The chemical engineer would focus on molecular properties and focus on the chemical process that could arise. He or she would probably look at the following parameters in order to obtain chemical stability in the system. In a wider perspective, the access to more catalytic material and changes in the composition of the mixture would be of consequences for the chemical engineers solution to the problem of chemical stability. The system could even be autocatalytic, i.e. that any product from the undergoing chemical reactions will act as catalytic material. The mixture is normally composed of a well-refined mineral oil, additives, water and air. 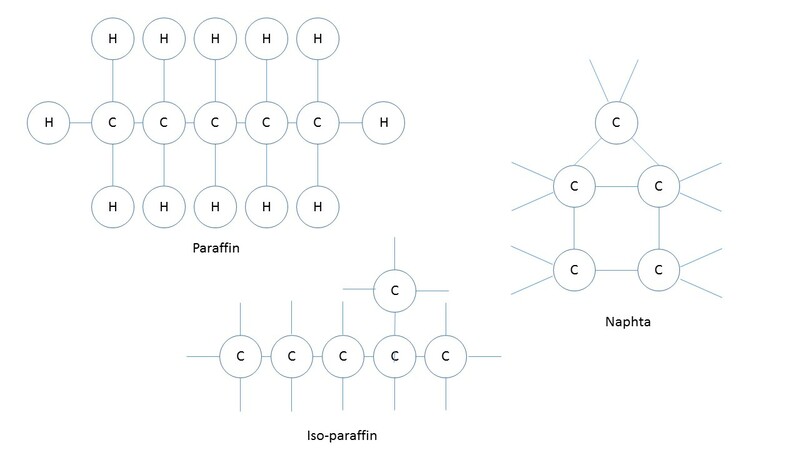 The hydraulic basis oil is a complex mixture of different hydrocarbon molecules with different properties, among them iso-paraffin’s, naphtha’s and aromatic hydrocarbons. Their ability to react with other atoms and molecules are expressed through the bonds of the carbon atoms. If all carbon atoms are bonded with single bonds the molecule is denoted saturated, and such molecules are normally chemical stable. Examples are found in figure 1, they are all saturated and found in hydraulic and lubricating fluids. On the other hand some types of hydrocarbons have double bonds between the carbon atoms, these are unsaturated and they are less stable than the saturated hydrocarbons. Examples of this kind of hydrocarbons is illustrated in figure 2. Mineral oils are composed of molecules that consist of 20 to 50 carbon atoms and that have an average molecule weight of 400 to 500. 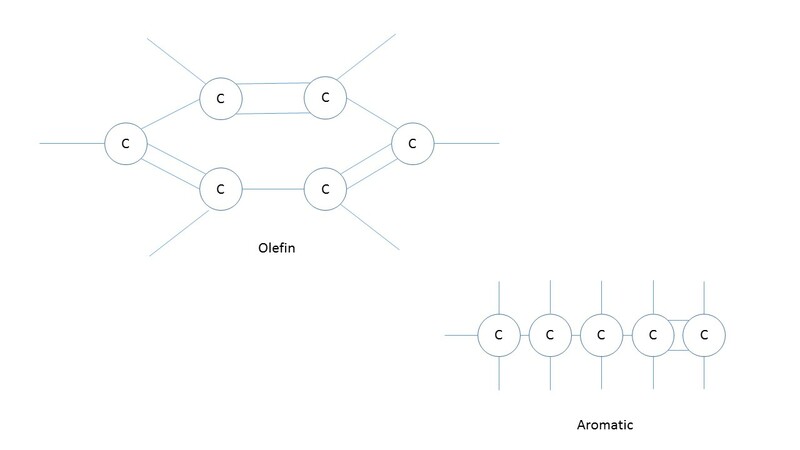 These big hydrocarbon molecules normally consist of all the basis types of hydrocarbons with the exception of Olefins that are too unstable and too willing to oxidize. Both hydraulic fluids and lubricating fluids based on mineral oils consists of to many different molecules to be analysed on a molecular level. However, it is important to remember that they consists of both saturated and unsaturated hydrocarbons. Where RH represents a hydrocarbon molecule consisting of a reactant (R) and a hydrogen atom (H). If the necessary amount of heath energy is available, will the hydrocarbon molecule be cleaved and a free energy rich radical (R*) and a free hydrogen atom will be created. The energy rich radical (R*) can bond to an oxygen molecule and establish an energy rich peroxide. This peroxide can in turn react with the hydrocarbon and a hydroperoxide and create a new energy rich radical. The reactions above are by no means exact, but they give us an indication about the reactions that may occur in the fluid. Most importantly, they give the chemical engineer the possibility to take qualitative precautions towards obtaining a system in equilibrium and give the system a long life. Reduce the amount of catalytic material. Catalytic material, in this context will primarily be copper and iron. The oxidation process is endothermal, i.e. heath is necessary. If the operational process is kept below 65 0C, oxidation will only rarely be a problem in modern oils, which is given oxidation inhibitors. Add an inhibitor. This is normally done, but it is important not to exceed the recommended temperature if these inhibitors should have the desired effect. It is also important that the oil is free from catalytic material. These inhibitors only slow down the oxidation process, and will eventually not have any effect. To the benefit of mechanical engineers, the chemical engineers solution to the problem of contamination do not differ to much from that of the mechanical engineer, even if the starting point for the chemical engineer was far more fundamental. The amount of air that can be dissolved depends on pressure and increase with increasing pressure. Sunlight, if the oil is exposed to sunlight a photo-catalytic process will occur and the oxidation process will accelerate. However, some important aspects is missed. Primarily of tribological nature. Both a hydraulic and a lubricating system produce particles through a number of wear process, and therefore produce catalytic material. Similar to the chemical autocatalytic process described above a spiralling process occur. All parts with relative motion produce particles, and these particles will again produce more particles. Consequently are we both mechanically and chemically dependent on a sufficient mechanical filter so we efficiently can get rid of these particles. The removing of particles, reduce the amount of catalytic material and therefore reduce the catalytic material available for the oxidation process. The oil will consequently increase its life span and the wear inside the system components similarly be reduced. A good filtration system is without doubt a good investment. The removal of particles, the catalytic material, is only solving one problem. In addition, the amount of reactants and the driving force heath must be controlled, i.e. air, water and oxidation products. 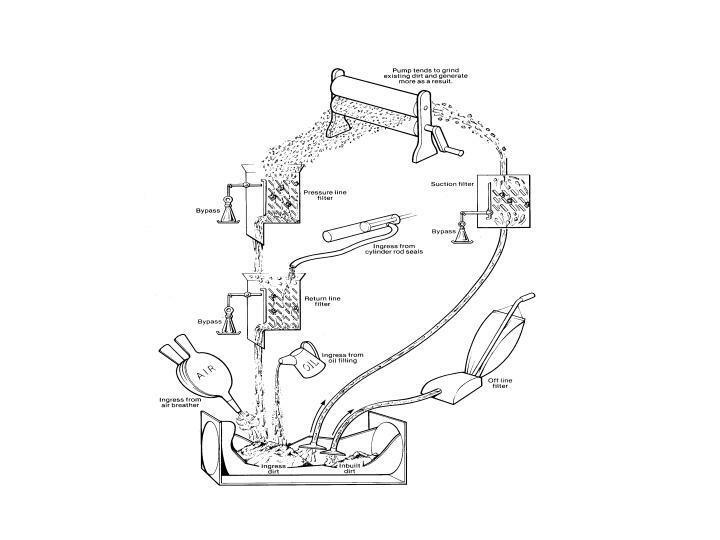 It is obvious that some is achieved by careful design considerations and installation of proper filtration, however, the removal of reactants such as oxidation products cannot be achieved by mechanical filtration, as this is contaminants on a molecular level. This can only be achieved by electrostatic cleaning, and one must again move into the world of chemistry. 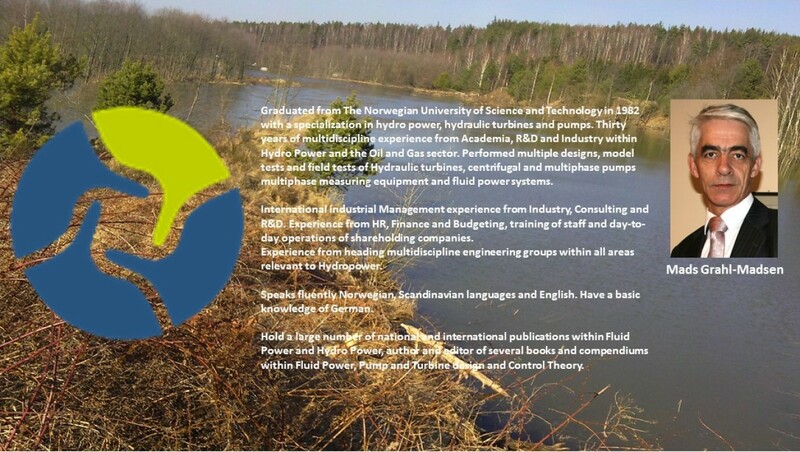 The reservoir shall act as a buffer for variations in oil consumption, a variation created by the systems working cycle or by thermal expansion of the fluid or both. The Reservoir shall through the sedimentation of contaminations, contribute to a cleaner fluid entering the system. Only the first of these tasks is it actually designed to do in any efficient way, and even when performing this one task it contribute to the admittance of reactants as water and air. Any heating engineer could tell us that it is a disaster of a heat exchanger, and any water and sewage engineer will tell us that it has not any change to act as a sedimentation basin with an extensive increase of its volume. Not to mention the frustration of the chemical engineer telling us that we has done everything worse by creating a real electrolyte. We need to move away from the cubic reservoir, and create a new geometry that do not store contamination, but lead them to the filter and other remedies for extraction. Such geometries has been developed successfully.